Darkness has engulfed the quiet town of Grimville! 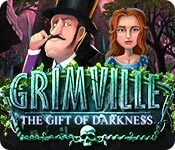 Use all your cunning and wits to unravel the evil intrigues and save Grimville from the invasion of Darkness in this exciting hidden-object puzzle adventure game! Interact with characters to find more details in your investigation, uncover the old legend of the Magic Tower and the Gift of Darkness, and solve the mystery of the missing mayor. Your choices determine the ending. What will you choose: the path of justice or selfishness? You decide: your choices lead to 2 different endings! Grimville: The Gift of Darkness is rated 2.9 out of 5 by 58. Rated 5 out of 5 by technocratee from Different is the word Played the full game, loved it, sometimes some games just get to you, I'm always looking for something different. This one I enjoyed, cartoonish, good graphics, dark but clear, personalities, loved the detective, appealed to the detective in me, didn't know who did it till a lot later. Rated 5 out of 5 by pookiewuv from THIS GAME WAS A WONDERFUL SUPRISE! Grimville:The Gift Of Darkness is really a wonderful suprise. It has great graphics and a good storyline. The cut scenes were really well done. I really liked the moral decisions I had to make concerning the fate of the characters. That was great. The puzzles were fun and made you think. The makers of this game did not insult my intellegence or waste my time or money. As a matter of fact, I got a good mystery, good graphics, great characters and music that was not annoying. And all this for 512MBs. This was a great value. My only complaint was that it was not a collectors edition. The length was not bad either. Please make another. Great job guys. Thanks. Rated 5 out of 5 by rosekaufmann from HAVE TO FIGURE IT OUT; NOT A CLICK-AND-GO I really like this game - it is so different from the usual fare. Now, it isn't easy because it is so different. You talk to a lot of people - some have nothing to say while others do. And just because someone has nothing to say now doesn't mean they won't have anything useful later. That's where the hint is useful, it will point you to someone who has a task or help for you. It's not easy to figure out where to go next. There is no hand holding, except as the hint sees fit to point out. But that's the fun. Most games, you know what to do and/or where to go and do. Here you have to figure it all out. The artistic style is nice - like the City of Fools as someone said. There is no voice over (except for hmphh, duh, et al), but written dialogue. I like the fact that what you do has an impression on subsequent play and there are different consequences to what you may do (like near the beginning when you have a choice to warn a robbee that he will be robbed or to help the robber). I expect this game will take some time so complete the investigation into a murder because of its unusual format and style. I will admit that I will have to play this game to completion when I am feeling patient since it isn't a click-and-go adventure like I'm used to - I'll look at it as a growing experience. Rated 5 out of 5 by baa27 from Something a bit different This is based on playing the full game. The storyline is interesting and there is a sensible progression and it's not confusing. It's a straight forward good against evil story. The games were fun, not exceptionally challenging and in 1 case, far too long winded, I ended up skipping the fire lighting, it was taking far too long. The character actually tells you what to do and where to find things in many cases which does lessen the challenges somewhat. I'm very easily bored by hidden object screens on any game and hate the ones that are made far too dark but this wasn't the case with most HOS. The level of challenge on the HOS is slight but for me it's perfect because the less time I spend searching for something the more I;m likely to enjoy it. It's taken me 4 or 5 hours over all to play at a relaxed pace. The graphics are good, the sound is good and you do move about the map a lot. I enjoyed it, it's not fast paced adventure or full of horror although there is a bit of a skulls theme but for someone who likes playing to relax and have a bit of a challenge without the gore of some HOGs I'd recommend the game. Rated 5 out of 5 by Telkiza from extraordinary game I downloaded the demo and played about 30 min. I like this game. Interesting story, good videos and graphics. The end of the game depends only on your choice which I have not found in any other game. I am excited to know how my game ends and I'm going to buy it. Rated 5 out of 5 by renatethomas from Different and fun Unlike any game I've played before, I found the grunting noises the characters make very entertaining. Graphics are very good. Rated 5 out of 5 by captwesker from City of Fools in a HOPA form! Only played for a few minutes and realized I had to purchase this game. Characters are cartoon-y, but interesting, and practically encourage you to talk to them just to see what their reactions will be. ************************** * DIFFICULTY LEVELS * ************************** Casual - Hint bar fills faster, search areas are indicated, and the puzzles are simple. Expert - Hint bar fills slowly, search areas are NOT indicated, and you will have a challenging time with the puzzles. ************ * VOICES * ************ There are no voice-overs, just voice/sound effects in the game. Dialogue is all done in bubbles. The only drawback some may find is that during cut scenes (which may be skipped), the dialogue may go faster than some can read. ************** * JOURNAL * ************** Your journal keeps track of the story as well as tasks that you have to perform. Tasks are checked off after being completed. ******************* * HINT BUTTON * ******************* Directs you to the area and has a black bar tip telling you exactly what to do. This seems to be the same in both difficulty levels. ************** * OPTIONS * ************** Music - Simple, and somewhat unobtrusive. You have the option to adjust the volume as desired. Sound - Cute, in my opinion, and worth leaving on. You have the option to adjust the volume as desired. Custom Cursor - Use the game's cursor. Disable to use your system cursor. Tutorial Mode -The game starts with a quick mini tutorial (in both difficulty levels) which is just a few bubbles explaining the different options available. This is to acquaint you with how the tasks are completed. You have the option of disabling this at any time. Full Screen - Choose to play in full screen or windowed mode. Aspect Ratio - Originally set to stretch to fit your screen. If you choose this option, it will give you black bar sides and a square viewing area. *********** * STORY * *********** You are a member of a secret society that stops the forces of darkness. You are on your way to Grimville where a man has died, and the Mayor and his daughter have gone missing. You must find your way to Grimville and find evidence of this, and if it is true, forward the information to the Hunters. As a fun TWIST on this, you also have MORAL CHOICES in this game. "The plot presupposes that you will meet characters and influence their fate. Consider your choices carefully, as they can be ambiguous." One of the first options for this to appear, is when you are collecting coins for your cab fare. A man asks you to help distract another man so he can pilfer that man's wallet. Do you help him? The choice, of course, is entirely up to you. Do you choose to be the Good Guy, or do you choose to be a Bad Guy? Your actions actually effect the outcome of the game. I definitely can't wait to see what happens!! This is a keeper for sure! Rated 5 out of 5 by ADamselInDesign from Refreshingly Different! I really like this game. It is truly interactive and unlike any other game we have been presented with as of late. All of your decisions have an impact on other characters so you must really pay attention to what is going on and use your best judgment. For example, you are in need of a few coins and a pick-pocket says he will share the money with you if you distract the helpless victim he intends to rob. You then have the option of helping the thief or warning the would-be victim. The graphics are very well done in a cartoon/caricature style and the music is non-obtrusive. There are no voice-overs which I do miss as with this game there is quite a bit of reading of both dialog and the cut scenes. For those of you who are easily offended, there are a few incidents of foul language/swear words but it is not often and the game would still be rated a PG. The minigames/puzzles are unique and quite difficult in the hard mode. I have not tried the easy mode but the game stated the puzzles vary in difficulty depending on the mode you chose to play. 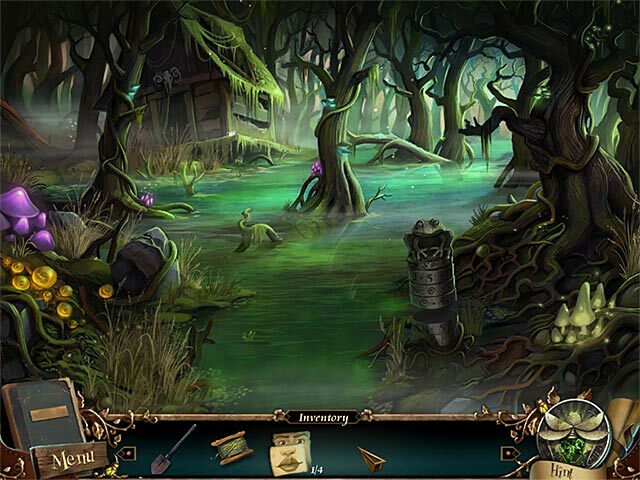 The hidden object scenes are the best standard style hidden objects I've encountered and I've played well over 200 games. As someone who is beyond sick to death of hidden objects, this really says a lot! 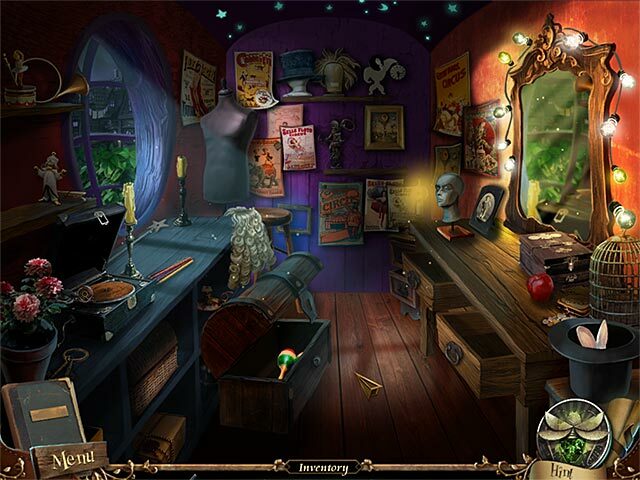 Instead of the usual junk piles, each hidden object scene is filled with objects that you would expect to see in the area they take place. 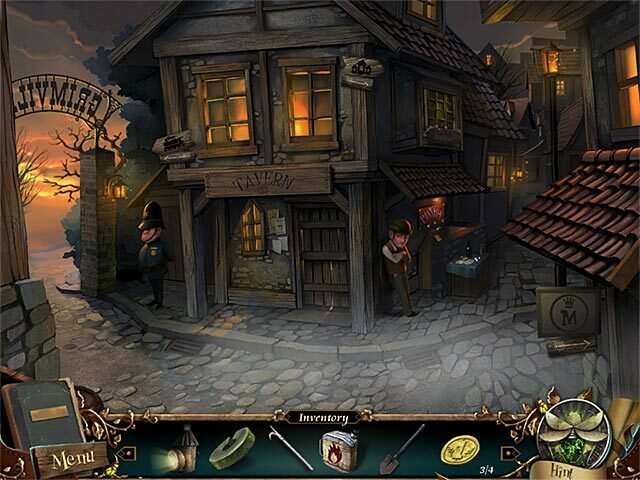 For example, you have to look for items in a blacksmith shop and in the scene you find metalworking tools, horseshoes, and other metal objects instead of the traditional sandwich sitting on the floor or unmelted ice cream stuck to a wall and modern electric appliances in a Victorian England game. This game may not appeal to all but I would suggest that you at least try the demo. I used a free game credit but after playing the game I would have definitely spent money on it as it is refreshingly different!